A St. John Brewers Root Beer Review was made possible by a Handy Father reader who goes by the twitter handle @NickGShow. Special thanks go to him and his family for visiting the Virgin Islands and bringing back this spicy, and unique root beer for us to review. Handy Father gives the Virgin Islands’, St. John Brewers Root Beer Review a 4 out of 5 stars for its refreshing flavor. 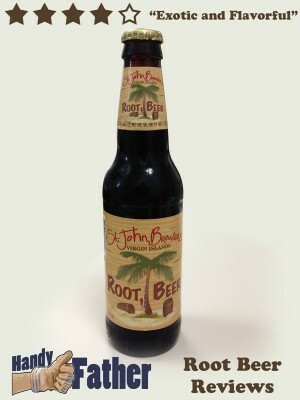 St. John Brewers Root Beer is made with pure cane sugar, and has many other high quality ingredients listed on its bottle. From anise to wintergreen, this root beer is hard to beat. Want to try this root beer enough to go to the Virgin Islands? St. John Island: Upon your arrival in Cruz Bay, the ferry dock is located almost in the center of town. You’ll follow the road to your left, along the water, past the Customs Lot on your left. Take a left at the Post Office, and follow the road the to far end of town, where you’ll find Mongoose Junction. Use the far entrance to the Junction, and walk towards the Deli Grotto. Use the spiral stairs to your right to get to the second level, and you’ll find The Tap Room next door to Caravan Gallery and across the hall from Holiday Homes. St. John Brewers Root Beer isn’t available in the United States, except for a small few locations, but be on the lookout for it in New Jersey, Rhode Island, Massachusetts, California, Florida, & Maine. It is definitely worth trying if you find some! Have you own St. John Brewers Root Beer Review or opinion? Tweet @HandyFather or leave a comment below!